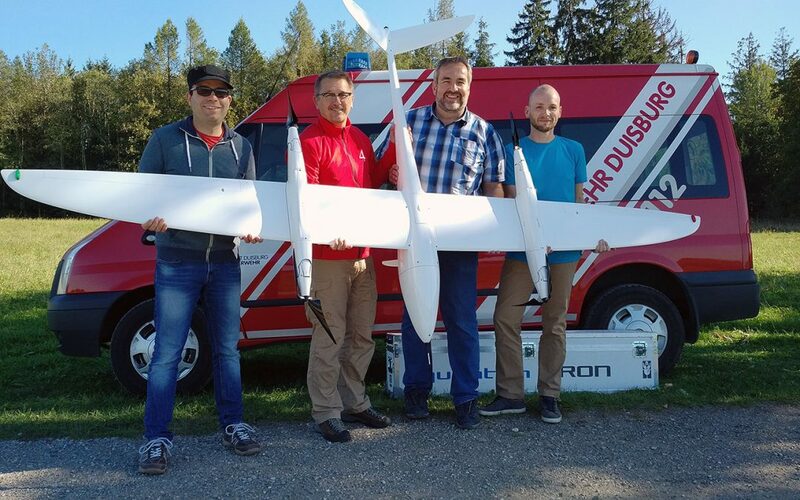 Four firefighters from the Duisburg main fire station were extensively introduced to mission planning and flight execution with the eVTOL UAV Tron from Quantum-Systems. Not only the basics for safe handling of the unmanned flight system were taught. Each of the future Tron pilots was tasked to fly a jointly designed mission independently on the 2nd day of the training. In addition to the automatic mode, in which the Tron independently flew mission targets, the pilots of the Duisburg fire brigade were also introduced to manual flying. After the two training days in Gilching, Dipl. Ing. Jörg Helmrich, Head of Department for Control Centre, Information and Communication Technology of the Duisburg Fire Brigade, emphasised: “With this drone, we will in the future also have extended deployment possibilities in Duisburg, in order to detect critical and potentially dangerous situations from the air at an early stage and to be able to coordinate our measures on this basis”. All pilots were enthusiastic about the Tron’s good-natured flight characteristics and the easy to learn operation of the mission planning software Qbase.